Thinkubator Challenge returned to Nottingham Business School on Wednesday 18 November with around 600 academics, research students, business postgraduates and final year undergraduates set to solve 40 business challenges. Students were split into hubs with Nottingham Business School staff facilitating the hubs. Participating businesses presented their challenge to the group before students set to work – with only three hours to analyse the issue and finalise their recommendations. Organisations involved, ranging from owner-manager entrepreneurs through to small and medium enterprises (SMEs), submitted problems on topics such as marketing, human resources and funding. At the end of the three hours they returned to the hubs to watch students present top line recommendations and later that day they received a written report outlining the hub's thinking, recommendations and advice on practical steps to take. New to this year's event was an additional Business Masterclass for partaking businesses, supported by D2N2. The Business Development; Facing Forward session included sessions on marketing, talent management and corporate social responsibility. The event held in the Newton building was opened with welcoming speeches from Professor Nigel Healy, Pro Vice-Chancellor and Head of College; Nottingham Trent Students' Union President, Jeremiah Anson; Louise Hendricks from DFR Market Research, a business which participated in last year's Challenge and Dean of Nottingham Business School, Professor Baback Yazdani. Jeremiah Anson, president of the NTU Students' Union, said: "This is a fantastic event that allows businesses to see that students do more than just complete their degree – they try and enrich themselves and give something back to society. "They'll be able to talk about today's event at interviews in the future as an example of putting their skills into practice. It could be what wins them the job." Professor Baback Yazdani, Dean of Nottingham Business School, said: "Today is about opening the doors of the university in a visible way to showcase the great expertise and skills that exist within the business school. "We are one of the most engaged business schools in the country, combining experiential learning at every level of its activity. Lots of places engage with business but we engage on a systematic and large scale." 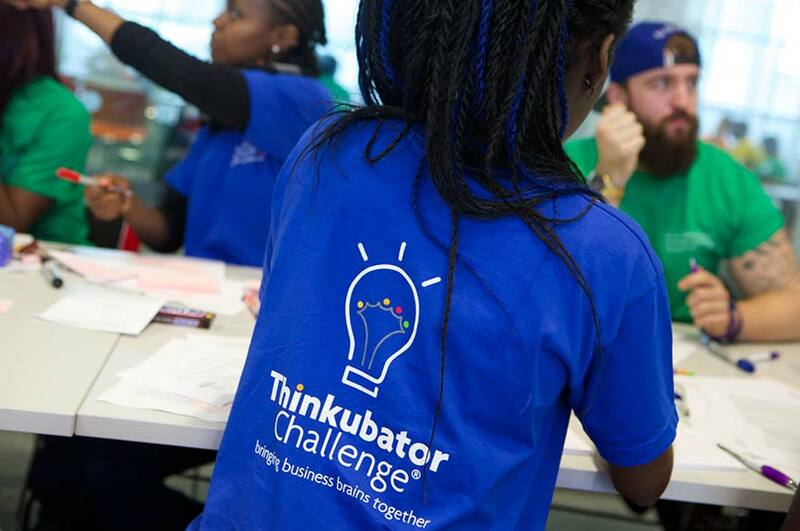 Thinkubator is the only event of its kind in Europe, and since its launch in 2013 it has now helped to solve more than 140 problems put forward by businesses from across the UK. D2N2 aims to help businesses profit from support and advice services in Derby, Derbyshire, Nottingham and Nottinghamshire.